Todd-AO is a post-production company founded in 1953, providing sound-related services to the motion picture and television industries. The company operates three facilities in the Los Angeles area. Todd-AO is also the name of the widescreen, 70 mm film format that was developed by Mike Todd and the American Optical Company in the mid-1950s. Todd-AO was originally founded to promote and distribute this system. 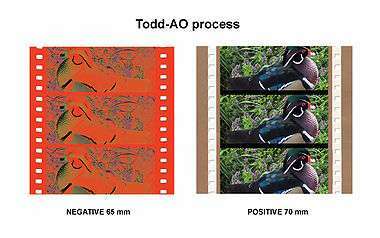 Todd-AO began as a high resolution widescreen film format. It was co-developed in the early 1950s by Mike Todd, a Broadway producer, in partnership with the American Optical Company in Buffalo, New York. It was developed to provide a high definition single camera widescreen process to compete with Cinerama, or as characterized by its creator, "Cinerama outta one hole". Where Cinerama used a complicated setup of three separate strips of film photographed simultaneously, Todd-AO required only a single camera and lens. The company's focus began to shift after Mike Todd's sudden death in an airplane accident in 1958. The 70 mm Todd-AO process was adopted by Panavision, Cinerama and others. As the production and exhibition markets became saturated with Todd-AO System hardware, the focus of the company gradually began to narrow down to the audio post-production side of the business, and Todd-AO became an independent sound mixing facility for commercial motion picture films and television after acquiring Glen Glenn Sound in 1986. In May 2014, Todd-AO's parent company, Todd Soundelux, filed for Chapter 11 bankruptcy protection. As part of the bankruptcy proceedings, they closed their Hollywood and Santa Monica facilities, leaving only their Burbank location operational. On November 17, 2014 the Todd-Soundelux Trademarks (Todd AO and Soundelux) and Copyrights (Sound Effects Library) were acquired in Federal Bankruptcy Court (Central District Case No. 2:14-bk-19980) by Rob Nokes of Sounddogs.com, Inc. While the 70 mm film width had been used before, most notably in the Fox Grandeur process in 1929–1930, earlier processes are not compatible with Todd-AO due to differences in frame dimensions, perforations and type of soundtrack. Todd-AO actually combined the idea of 65 mm photography with frames five perforations tall (also a process with a history extending back to the silent era) with 70 mm wide prints and the magnetic sound that first appeared with CinemaScope, although improved with six channels and much better fidelity. The 70 mm print adds 2.5 mm extra down each edge to accommodate some of the soundtracks. Thus the print actually carried 65 mm perforations and the 65 mm negative was contact printed directly to the 70 mm print stock, as the sprocket holes aligned. Four lens options covered a 128, 64, 48 or 37 degree field of view. Films were shot on 65 mm negative and the images printed onto 70 mm print stock (5 mm larger to accommodate soundtracks) for projection. The aspect ratio of this format was 2.20:1. The use of 65 mm photography and 70 mm printing became the standard adopted by others: Super Panavision 70 (essentially the Panavision company's version of Todd-AO) and Ultra Panavision 70 (the same mechanically, but with a slight 1.25:1 anamorphic squeeze to accommodate extremely wide aspect ratio images) are both 65/70 processes. The IMAX format also uses 65 mm camera and lab film to create 70 mm prints for projection (also known as the 65/70 mm process); conforming to the pitch and perforation standard for 70 mm film that was established by Todd-AO in the mid-1950s: the IMAX frame is 15-perfs long and runs horizontally through the projector, whereas the Todd-AO frame is only 5-perfs high and runs vertically through the projector. The Soviet film industry also copied Todd-AO with their own Sovscope 70 process, identical, except that both the camera and print stock were 70 mm wide. While Todd-AO was intended to be "Cinerama out of one hole", the extreme wide angle photography and projection onto a very deeply curved screen (which is what that would imply) saw little use. Most Todd-AO theatre installations had only moderately curved screens and the extreme wide angle camera lenses were used only on a few shots here and there. Todd-AO films made after 1958 used a conventional flat widescreen, and resembled ordinary films, except for their greater clarity and six-track stereo sound. A variation on Todd-AO called Dimension 150 did, however, make use of Cinerama-like deeply curved screens. Only two films were made in Dimension 150 – The Bible: In the Beginning, directed by John Huston, and Patton, starring George C. Scott. In some venues, however, Todd-AO and Dimension 150 films received their first run in Cinerama theatres in order that they be shown on a deeply curved screen – such as the first Atlanta, Georgia showings of The Sound of Music. In the 1970s, under the leadership of Dr. Richard Vetter, Todd-AO made an attempt to compete with Panavision in the 35 mm motion picture camera rental market. The company built a series of anamorphic lenses in the 2.35:1 scope format, and owned several camera bodies (Mitchell and Arriflex) that they would provide with the lens package. Of the five original Planet of the Apes films, Conquest of the Planet of the Apes is the only entry filmed in Todd-AO 35 using Arriflex ARRI 35IIC cameras with lenses provided by The Carl Zeiss Group, (the other Apes pictures were filmed in Panavision). 1953: Mike Todd and the American Optical Company formed as a joint venture called Todd-AO for the purpose of developing and distributing a large film format presentation system which incorporates a wide, curved screen with multi-channel sound. 1955 & 56: Mike Todd produced two films which featured the new Todd-AO system. 1958: Mike Todd was killed in a plane crash. 1960s and 1970s: Although several blockbuster films were produced using the Todd-AO or Panavision versions of the 5-perf 70 mm format, market penetration of the Todd-AO system lost momentum, and was overtaken by the development of IMAX in the 1970s. 1999: Todd-AO was acquired by Liberty Media Group and became part of its Liberty Livewire entity. 2002: Liberty Livewire was renamed Ascent Media Group. 2005: Ascent Media Group was spun off from owner, Liberty Media, into Discovery Holding Company. 2007: Discovery Holding Company announced a restructuring plan where it intended to spin off its interest in Ascent Media and combine Discovery Communications with Advance/Newhouse Communications into a new holding company. The reorganization was completed on September 17, 2008. 2008: What had previously existed as the "Creative Sound Services" division of Ascent Media Group was spun off from Discovery Holding Company to create CSS Studios, LLC, which became a wholly owned subsidiary of Discovery Communications. This transaction included the assets of Todd-AO, Soundelux, Sound One, POP Sound, Modern Music, Soundelux Design Music Group and The Hollywood Edge. 2012: CSS Studios, LLC was acquired by Empire InvestmentHoldings, which filed bankcruptcy for Todd Soundelux in May 2014. 2014: In May 2014, Todd Soundelux filed for bankruptcy, closing their Hollywood and Santa Monica facilities. The following films were produced in the 70 mm Todd-AO format. (This list does not include films photographed in Todd-AO 35 (see above)). ↑ Palank, Jacqueline (22 May 2014). "Soundelux Enters Bankruptcy, Seeks Cash". The Wall Street Journal. 1 2 Frazer, Bryant (22 May 2014). "Todd-Soundelux Files for Chapter 11 Bankruptcy Protection, Shuttering Hollywood and Santa Monica Locations". Studio Daily. ↑ "Cinema: The New Pictures". Time. October 29, 1956. Retrieved 2010-10-01. ↑ Kurtti, Jeff (1996). The great movie musical trivia book (1. print. ed.). New York: Applause. p. 163. ISBN 9781557832221. Retrieved 6 January 2013. ↑ "Rivoli Theatre". Cinema Treasures. Retrieved 2009-06-02. ↑ "Cinestage Theatre". Cinema Treasures. Retrieved 2009-06-02. ↑ "Hunt's Cinestage Theatre". Cinema Treasures. Retrieved 2009-06-02. ↑ "CNN Money". CNN. Archived from the original on December 31, 2007. ↑ Burlingame, Jon (2007-08-22). "Todd-AO's fate could impact scoring". Variety.